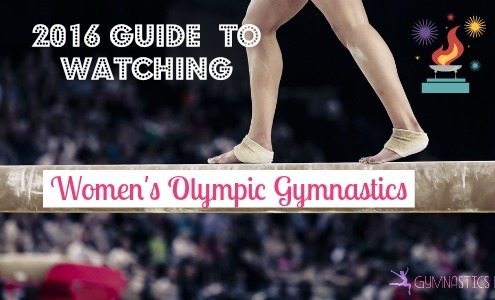 The 2016 Olympic gymnastics competition runs Saturday August 6th through Tuesday August 16th : here is your guide to watching women’s gymnastics at the Olympics on TV. Below you will find both the TV and streaming schedules, information about the US Women’s Gymnastics Team, and the competition and how it is scored. If you are watching the Olympics and considering having a viewing party, here is how to throw a Fun Olympic-Themed Party. Gymnast Minimum Age: 15, Gymnasts must have been born in or before 2000.
tall, 4 feet long and 3 feet wide table. 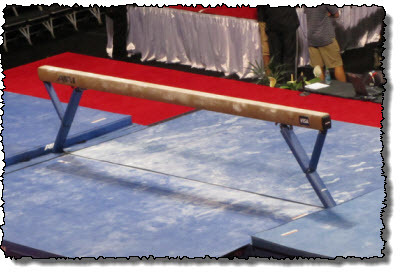 Uneven Bars– The bars are made of fiberglass. The high bar is 8.2 feet tall and the lower bar is 5.6 feet tall. Balance Beam– The balance beam is 4 inches wide, 4 feet tall and 16 feet long. It has springs in it and is covered in leather or suede. Floor Exercise– The 39 feet by 39 feet square spring floor is made of springs, rubber foam and plywood. All Olympic events are going to be streamed live on NBCOlympics.com and the NBC Sports Live Extra app. There are 4 phases in the artistic gymnastics Olympic competition. Scores from each of the sessions do not carry forward to the next: this is referred to as the New Life scoring rule. Teams qualify for this session based on their performance at the World Championship the year prior to the Olympics. During the team qualifying competition the five gymnast teams will compete to determine which teams will advance to the team finals. This competition is also used to determine which individual gymnasts will advance to the individual, all around, and event finals. The format of this session is 5-5-4, which means that 5 gymnasts are on each team, 5 gymnasts will compete and 4 scores will count. The lowest score on each event will be dropped. The top 8 teams will advance to the team finals. The top 8 women on each apparatus will advance to the event finals. And the top 24 ranked individual gymnasts will proceed to the All-Around Finals. The team finals competition will consist of the 8 teams that advanced to this day from the team qualifying session. The format of this session is 5-3-3. Where there are 5 gymnasts on each team, 3 gymnasts will compete and each of the 3 scores will count. This is crucial because none of the scores will be dropped. The individuals that qualified during the team qualifying session will compete in this session for the all-around title. Only two gymnasts per country are allowed to advance to this competition. During the all around session each of the gymnasts compete on each of the 4 events. All four scores are added together and the three highest scoring gymnasts will receive medals (gold, silver, bronze). In the event finals competition, the top eight gymnasts from each event during the team qualifying session will compete for metals. Only two gymnasts per country are allowed to advance to the event finals. Penalties are neutral deductions, such as stepping out of bounds. A 9 judge panel is used to determine the score for each event. The difficulty score is determined by 2 judges. The execution score is determined by 5 judges; the score is calculated by dropping the highest and the lowest score from these judges and averaging the other 3 scores. The remaining 2 judges on the panel are the reference judges. While the Olympic gymnastics deductions aren’t the same as the USA gymnastics Junior Optional program deductions–they are very similar and here is a list of those deductions that you can use as a guide when watching the Olympics on TV. 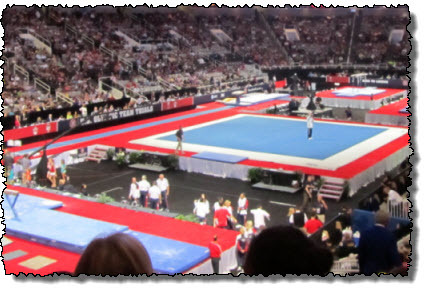 The 2016 US Olympic Gymnastics Team was determined at the Olympic Gymnastic Trials in San Jose, California July 8th-July 10th. Practice Schedule: Raisman trains for 35 hours a week. She has both a morning and an afternoon workout. US Olympic Team Alternates: Ashton Locklear, McKayla Skinner and Ragan Smith. Thanks for all your well written info. I have tried and tried to find out who are the nine women’s gymnastic judges and I cannot find their names and/ or countries. Any information would be appreciated! Karen, I am having the same problem! I would like to know what it takes to be an olympic judge. writing training documents, with some important strategies. the seventeenth century architect An article should be pulled by a conclusion together.